Who’s the Grumpiest Cat in the land? Grumpy Cat (a.k.a. Tardar Sauce) was born on April 4, 2012. She is a female cat who’s face appears grumpy because of feline dwarfism and an under bite. Grumpy Cat soared to popularity when a picture of her was posted to the social news website Reddit on September 22, 2012 by the owner’s brother. Tabatha Bundesen, Tardar Sauce’s human parent, says that she and her brother Pokey were born to normal kitty parents. Due to Tardar Sauce’s dwarfism, she is undersized and her hind legs don’t work quite the way they should (you can see her cute waddle-walk in the following video). Oddly enough, her human insists that Tardar Sauce is calm and “really nice”. It’s her brother Pokey who’s actually the grumpy one. Image from Wikipedia. Grumpy as she is, Tardar Sauce wasn’t satisfied with just being an internet sensation. Oh, no. She needed a bestselling book deal too. Teaches the fine art of grumpiness and includes enough bad attitude to cast a dark cloud over the whole world. What’s the big about all the grumpy? I seriously did not get the Grumpy Cat sensation. Maybe because I pretty much ignore sensations of any sort … twerking included. So I didn’t pay much attention to Her Grumpiness … until I saw the following video of a grumpy dwarf cat getting the royal treatment at the Happiest Place on Earth. That’s when I finally realized she was a real cat, and that was her real face—not just a photoshopped expression. (I know, I’m a little slow some times.) I loved the way she walked, because it told me that she’s a special needs kind of kitty, which makes her all the more adorable. Plus… this cat rates getting to go to Disneyland when no one else is there!!! Visiting royalty doesn’t get that type of exclusive treatment. Only Grumpy Cat. She instantly became my new hero! I’m an animal lover, and I get a little goofy (pun intended) over animals in general, grumpy or not. But I still didn’t get the world-wide Grumpy Cat craze, until I read the blog post by Josh Getzler, Why we need Grumpy Cat. What do you think? 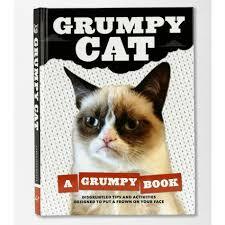 Are you a Grumpy Cat fan? Before you answer, watch the following video. If you’re not a fan, you just might become one in the next minute and a half. Oh, she’s so cute. I always knew she wasn’t really grumpy. I used to subscribe to the grumpy cat feed, but it was all very negative captioning on the same few photos, so I got a little annoyed with it. That’s nothing against poor little Tardar Sauce, who is adorable all by herself.